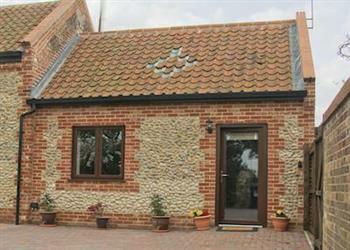 Annexe at Church Farm Barn in Ingham, near Stalham sleeps 2 people. The Annexe at Church Farm Barn is a single-storey holiday property, adjoining the owners’ home and located in an ideal location from which to explore this delightful area. Being all on the ground floor, the property has a wet room complete with grab rails and a shower seat, making it wheelchair user friendly. Sea Palling is just 3 miles away, with its lovely unspoilt beaches. Visit the famous lighthouse at Happisburgh, see the colony of grey seals with their pups in the winter at Horsey Gap, or explore the Norfolk Broads and hire a boat from Stalham. Hickling Broad is just 3 miles away, here you can go sailing, windsurfing and marvel at the wildlife. For the keen gardener, East Ruston Old Vicarage has 32 acres of outstanding gardens. There are National Trust properties in the region including Felbrigg Hall and Blickling Hall. Alternatively, spend a day in the fine city of Norwich with its cathedrals, castles, museums, theatres and cobbled streets lined with shops and cafés. Walking, bird watching, cycling, sailing and fishing are all available locally. The beach is 3 miles from Church Farm Barn near Stalham. With the shops and pubs 1¼ miles, and restaurant 500 yards. Living area: With 32 Freeview TV, DVD player and wooden floor. Kitchen area: With electric oven, electric hob, microwave, fridge, washing machine and tiled floor. Wet room: With shower, toilet, grab rails, shower seat and heated towel rail. Ground source underfloor central heating, electricity, bed linen, towels and Wi-Fi included. Small enclosed lawned garden with patio and garden furniture. Private parking for 1 car. Wheelchair access. No smoking. Holidays at Annexe at Church Farm Barn run from Friday to Friday. Pets allowed at Annexe at Church Farm Barn. For a better idea of where Annexe at Church Farm Barn is, you can see Annexe at Church Farm Barn on the map below. Annexe at Church Farm Barn is in Norfolk; should you be on the lookout for a special offer, you can find all the special offers in Norfolk. It's always worth checking to see what is on offer at the moment. Do you want to holiday near Annexe at Church Farm Barn (UKC350), you can see other cottages within 25 miles of Annexe at Church Farm Barn; have a look to find your perfect holiday location.